In this article, you will learn to use switch control statements to control the flow of your program's execution. How it works (with flowchart)? How Switch Statement in Swift works? It takes the expression and compares with each case value in the order (Top -> Bottom). 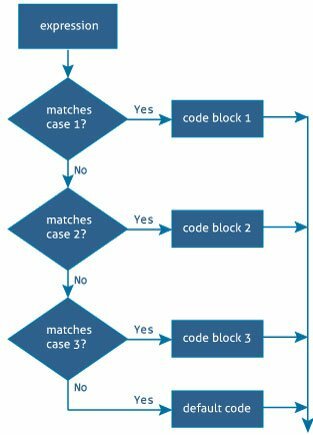 If there is a match, the statement inside the case are executed and the entire switch statement finishes its execution as soon as the first matching switch case is completed. If there is no match for the case, it falls to the next case. The default keyword specifies the code to run if there is no case match. Note:The body of each case must contain at least one executable statement. In the above program, the switch statement starts by matching dayOfWeek value with case 1. Since dayOfWeek value doesn't match the first case value 1, it falls to the next case until one matches. Since case 4 matches the switch expression, the statementprint("Wednesday") inside the case executes and switch case terminates. If none case was matched, statement inside default executes. If you use the fallthrough keyword inside the case statement, the control proceeds to the next case even if the case value does not match with the switch expression. In the above program, case 4 executes the statement print("Wednesday") and fallthrough keyword proceeds to case5. The statement print("Thursday") inside case 5 executes even if the case doesn't match with the switch expression. Therefore, you can see output Thursdayin the console. This case binds the switch expression value to temporary constants or variables for use in the body of the case with let keyword. This is known as value binding. You can also apply condition to those values with where clause. For multiple where conditions, you can concatenate them using && operator as in the example above. If the case doesn't satisfy the condition defined inside where clause, statements inside those case block doesn't executes and falls through to compare next switch case. This case matches the tuple first element with the string literal "Swift"and also checks if the second element lies inside the one sided range..<4. This case matches the tuple first element with the string literal "Swift" and also checks if the second element lies inside the one sided range4…. This case binds every values of the tuples to the temporary constants or variables.